- Decide anytime to transfer them to the JSON3D Public Gallery (Gallery) to enrich the JSON3D network. Sign-in on the site by clicking the Sign In menu. To ease and secure your account creation, we provide login mechanism using Janrain Engage technology. If you do not yet have an account on one of the above providers, and do not want to, you can create an OpenID with one of the suppliers on this page. Once you are successfully logged with your account, you will be prompted to enter your Username, First Name, Family Name, Company and Country. Validate and then you are automatically registered into the JSON3D private gallery. You are now ready to upload 3D CAD files. For the providers (LinkedIn, Twitter and OpenID) which do not give us a confirmed e-mail address, you will have to enter a valid e-mail address and we will send to you a confirmation e-mail to check this address. This e-mail contains a link that you must follow to validate your account. - After Sign In, you have access to the Upload menu. - Browse your local 3D CAD files to select a 3D CAD file to upload. - Once your file is uploaded, it will be converted and then a validation phase will occur. - In My Json3Ds, you will find the JSON3D file in “waiting for validation” status. - You can now view your JSON3D file with the basic functionalities (rotate/pan/zoom/rendering/views). - From your JSON3D private gallery (My Json3Ds), click on Properties to rename title, add/change description or delete your JSON3D models. You need to upload more than 5 models? You can publish some of them to release new slots. See “Publishing models” description below. - As a free application, JSON3D Gallery is limited to 10 MB CAD Files. The TFTLabs products works directly on 3D data from all native or generic CAD formats (more than 20 formats) up to their latest revision. Free JSON3D Gallery is limited to parts only. The TFTLabs products works on parts and assemblies (contact us for details). Once your models are available in your account, you may decide to publish them. Your model will be visible for everybody and no modifications or deletion will be allowed. 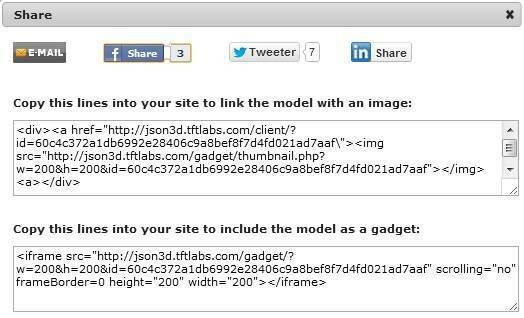 Then you can share the JSON3D model as simple URLs that you can freely embed into emails, social networks or web pages. TFTWeb, TFTPad and TFTLabs are registered trademark of TFTLabs SAS, All other trademarks are the property of their respective owners. Copyright © TFTLabs SAS. All Rights Reserved.